Only partial results available. This was a 48-player knockout handicap, in which the 24 losers in the first round competed in a separate sequence for third and fourth prizes. Many of the exact results have not yet been found, though in most cases we know who beat who, at least in the main knockout sequence for first and second prizes. I have information on the first and second rounds from the Westminster Papers of 1 Jan. 1872 (p.153); other information I have from Tim Harding. In each pairing, the first player to win two games was supposed to go on. Where the result of a pairing is not known exactly, I use the information I have, sometimes a partial result, but usually knowing who won the pairing in the end. So in some cases, draws have been counted where we knew they occurred. When we only know who beat who, I record the result as 1-0. The Era of 21 Jan. 1872 (p.14) has de Vere playing 'Thompson' in the second round, when this should be Ormsby. I am guessing that it was W.T. Chappell, rather than H. Chappell who participated in this event, and that the 'Clark' here was 'J. Clarke', who participated in the City of London handicap the year before (as did 'R. Clarke', but he was in a higher section, and this time round we are looking for a class 4 player). 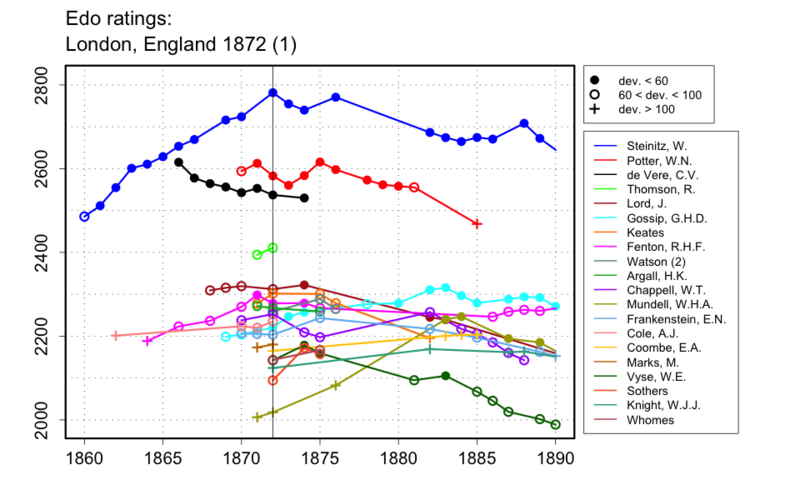 Forster gives the year as 1871. The Field of 9 Dec. 1871 gives the initial pairings (information from Tim Harding) so the event apparently began in Dec. 1871. Steinitz' games against Potter were played in Feb. 1872, according to the Field of 9 Mar. 1872 (information from Tim Harding). The final pool was between Steinitz, Keates and Thompson, and although we know that Steinitz won first prize with Keates 2nd, I don't have the scoring of the final pool games. Fenton won 3rd prize and Baxter 4th from the secondary knockout sequence (Field 25 May 1872, p.476, from personal communication with Tim Harding). From the Westminster Papers (1 Jan. 1872, p.153) we have 3 results (one partial) from the secondary sequence, listed last here.